Green-fingered student and staff volunteers from City, University of London have donned gardening gloves this week, to take part in a community gardening project. Set up by the University in partnership with Islington Council, the project saw volunteers giving the park in Northampton Square a makeover and tidy up. During the gardening session, volunteers tidied up overgrown flowerbeds, swept leaves and cleaned up the historic wrought-iron flower planters. They also planted new shrubs and flowers from geraniums to hydrangeas. The long term plan is for the park to become a home for the University’s gardening club, where volunteers from the local community and the University can work together to create a beautiful green space for everyone to enjoy together. The aim is to create a sense of community, giving local residents and students a chance to get to know one another. The gardening project will also allow students living in Islington to give something back to the community they enjoy being a part of. The new garden was designed by local resident Clare Carolan, who picked plants that will provide year round colour in the gardens. Bee-friendly plants like geraniums were also chosen, to provide pollen for the bees that live in a hive on the roof of the University. 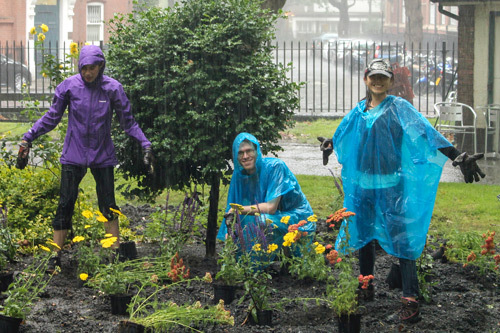 Islington Council Park Ranger Andrew Hillier said: "We greatly appreciate the time and effort that City, University of London’s students and staff have put into community gardening in Northampton Square. "The Square looks great, and it shows again the important role volunteers and residents play in making Islington’s green spaces look their best. We look forward to working with City in the future to continue the transformation of this beautiful green space in the south of the borough." 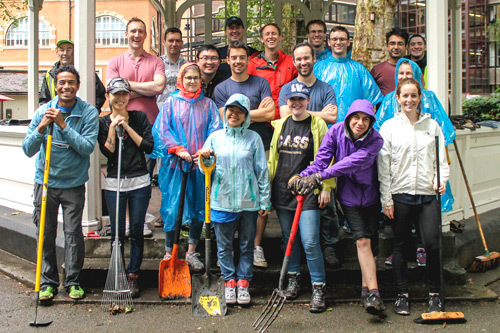 George Watson is studying for an MBA at Cass Business School and persuaded his fellow students to volunteer for the gardening day. He said as their course was due to end in the next few months, he wanted to do something with others in his course to leave a mark at City. George said: "Many of the students will be going back to different countries or to their home towns and will be leaving London. I wanted us to leave a legacy. 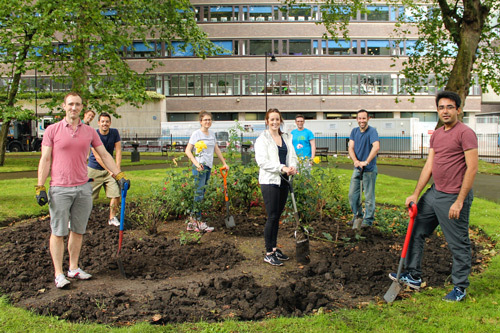 We decided gardening in the park outside City would be a great way to end our final year." George said that despite the rain, the group had a great day and were really proud of what they achieved. "The park is looking great. I'm really happy that so many people turned up and the impact our work has had on the park."